Altitude range: less than 100 metres above sea level. Habitat: In the wild, Cotyledon oblonga is a succulent undershrub found in coastal bluffs and dunes, or in rock crevices in exposed situations of slopes often in low treeless vegetation among grasses. 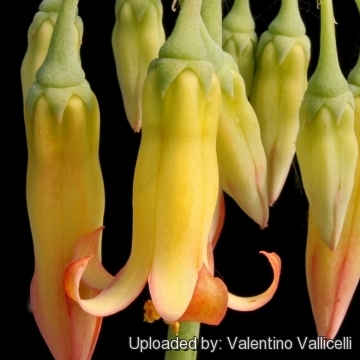 It is also widely cultivated and popular in gardens in many subtropical countries, it has becoming naturalized and is often invasive in vast places in California, Australia and New Zealand. 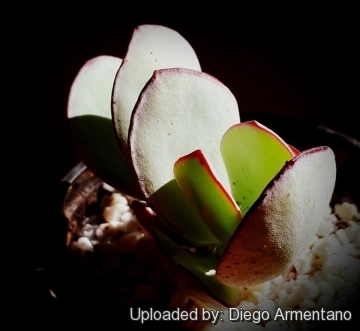 Description: Cotyledon oblonga (now considered a subspecies of Cotyledon orbiculata) is distinguished by long silvery-white to pale grey-green chalky-looking finger-like leaves, that take a striking purplish colour in times of drought and stress. 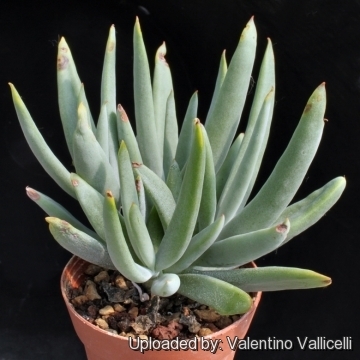 Habit: It is a robust evergreen succulent shrublet that branches from ground level, forming large clumps. Stem: Robust, branching, bushy, erect or reclining, fleshy, glabrous towards the base, pubescent above, elongated, up to 1 m long and 1-2 cm in diameter, stiff, with the tips growing upward simple or once or twice divided older part leafless. Bark pale, wrinkled, with noticeable scars of fallen leaves. Leaves: Opposite, or subopposite–decussate, sessile, generally 2–4 pairs crowded or not in the upper 2–9,5 cm long part of the stem, mostly erect or sometimes partially reflexed, 5-10(-18) cm long, (1-)2-3(-4) cm broad, fleshy, obovate, wedge-shaped to oblong–linear, somewhat flattened, cuneate at base, usually tipped with an abrupt point, hairless or seldom velvety, pale green, grey-green, grey-white, blue-grey with a powdery waxy coating over the whole leaf that helps reflect sunlight and conserve water. Margins entire sometimes with deep-reddish, contracted or narrowing into a short subpetiole. Inflorescence: Terminal, cymose, loosely panicled, 10-30 flowered usually less than 15 cm. 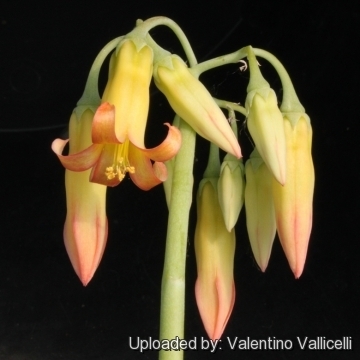 in diameter, glabrous, whitish–bloomed, clusters at the end of an erect nearly leafless peduncle 20-40(-50) cm long. Pedicels pendent in flower, erect in fruit. Flower: Bell-shaped to tubular approx 3,5 cm long, pendent, glabrous. Pedicels pendent in flower, erect in fruit, 1–3 cm long. Tube cylindrical or subcylindrical, 1,5–2 cm long and (6–)10-20(–25) mm in diameter, with hairy ring in proximal 1/4. Calyx 4–5 mm long. Calyx, corolla circumscissile at base in fruit. Sepals triangular 2-5 mm long. Corolla salmon, pinkish or orange–yellow, lobes 10–15 mm, recurved. Stamens 10, exserted epipetalous on tube; filaments 18–25 mm long. Anthers ovate, yellow 2,5–3,5 mm. Styles about 15 mm long, exserted with stigmas not attaining the anthers. The smell is very strong and something resembling that of decaying roast beef or of some of the fungi. Pollinated mainly by honeybees. Blooming season: Flowers all year round, though primarily in later winter and early spring. Seeds: Extremely small, weighting bout 0,01 mg. These small seeds (also known as dust diaspores) can be blown about like dust particles without any special devices for buoyancy. In this species, enormous numbers of seeds are produced at the cost of fewer, larger sized seeds . Because this plant occur abundantly in the arid areas and has specific habitat requirements, the production of increased numbers of seeds is essential to enhance the probability that at least some seeds will reach a favourable germination site. Except for their small size, these diaspores generally lack other appendages to further promote dispersal by wind. Several genera of the Crassulaceae, e.g. 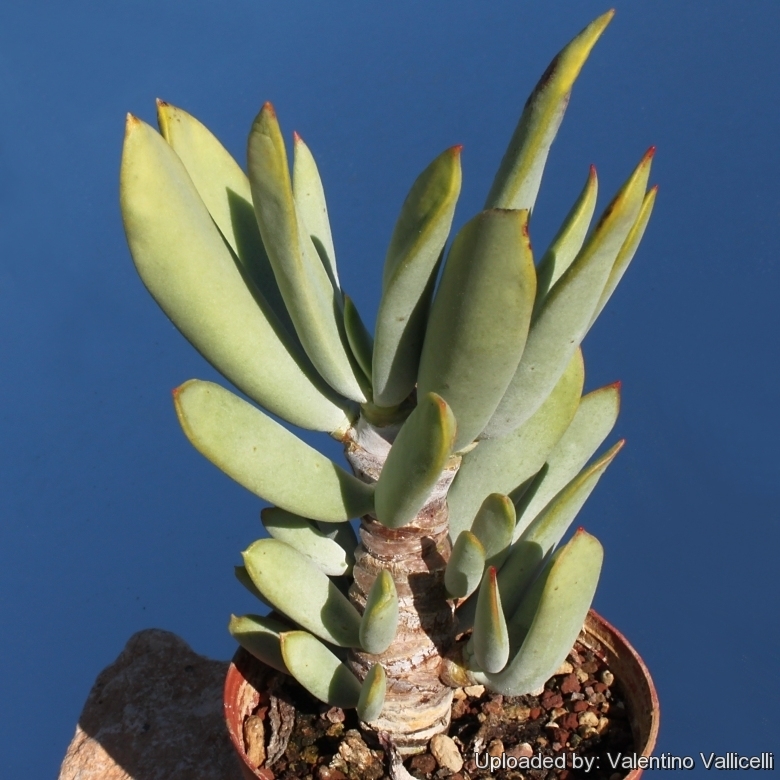 Crassula, Tylecodon and Cotyledon, occouring in the arid areas of southern Africa have very tiny dust-like seeds. The production of numerous dust-like seeds by desert species serves as an escape strategy to prevent mass consumption of seeds. These tiny seeds are carried by the wind to cracks and furrows in the soil and are then covered with fine soil particles. 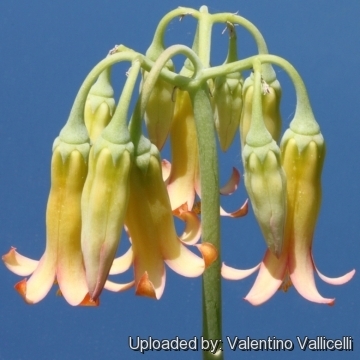 Cultivation and Propagation: Cotyledon orbiculata var. oblonga is widely grown and not difficult to cultivate. Cotyledons are very responsive to differing cultural conditions both as regards colour, length and shape of leaves, rate of growth and size of plant. Warning: The plants are highly poisonous to humans and domestic animals, especially sheep and goats, and the meat of animals killed by cotyledonosis remains toxic even after cooking. Poisoning may be acute or chronic, the latter due to the cumulative effect of the toxin.